Home Breaking Travel News Damyang: Bamboo forests and everyone’s favorite – bamboo food! Damyang, located in the northernmost place on the globe where bamboo can be found – on the Korean peninsula – is known for its bamboo gardens. Here, bamboo is revered for its strength, diversity, and giver of life, just like the sun and the rain. Here, bamboo therapy is more effective than forest therapy – where visitors slowly (ssamok ssamok) follow the forest trail in the bamboo garden (juknokwon). In Damyang lies a tourist secret hidden like a treasure just waiting to be found and enjoyed, and by enjoyed, we mean not only in the bamboo forests and garden, but also in many people’s favorite activities – the enjoyment of food! If the Giant Panda makes his diet 99 percent out of bamboo, who are we to argue that it must be delicious? The young edible shoot of the bamboo plant is a favorite vegetable among the people of Asia, and the tender crisp shoot has numerous health-boosting qualities as well. It is no wonder that it is a favorite dish all by itself or as an ingredient. Bamboo shoots, called Juk Sun (or Jook Soon) in Korea, lends its mild sweet flavor that is similar to baby corn to many favorite recipes. 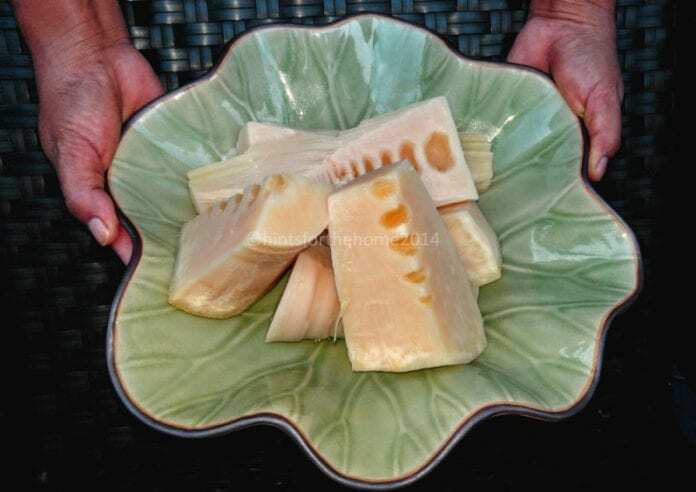 Bamboo shoots are a favorite among many Asian countries. In Japan, China, and Taiwan, pickled bamboo shoots are regularly eaten with meals, much like Korean regularly have kim chi with their meals as a side dish. In Thailand, boiled shoots are used in soups, salads, stir fries, and curries. In Nepal, tama or fermented shoots of bamboo is a seasonal delicacy. Water-soaked shoots, called Khorisa, are eaten in Assam, India, during the monsoon season, and in Vietnam, chopped shoots are stir fried with other vegetables. Bamboo shoots makes a delicious broth and is used to prepare many savory soups. Bamboo Shoot & Korean Red Ginseng Slices in Mustard Sauce offers a great sweet and sour taste with an addition of mustard sauce to diverse fresh vegetables. 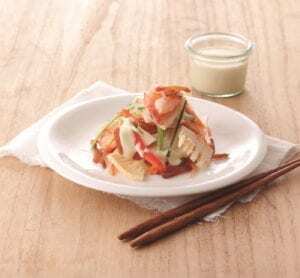 Just look at the many delicious ways bamboo shoots can be enjoyed! Bamboo shoots can be bought canned, bottled, and refrigerated and are available in local markets and online stores throughout the year. If you are lucky enough to get fresh bamboo shoots, like the Great Panda, store the unpeeled shoots in a covered glass or plastic container in the refrigerator for up to 2 weeks. If the shoots are exposed to sunlight, a bitter taste develops, so the cool dry environment of the refrigerator is ideal for storing the raw vegetable. Cooked shoots can also be frozen. And remember, the best place to revel in fresh bamboo, sprouting from the earth may just be that gem of a destination in Korea – Damyang, where a garden without bamboo is like a day without sunshine. eTN has shared more information on this special region in South Korea, Damyang.